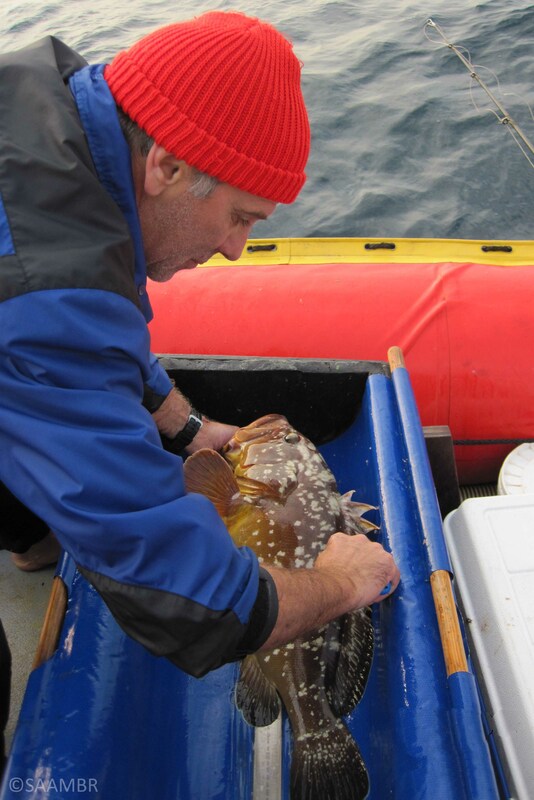 ORI senior scientist, Bruce Mann led the 45th Pondoland Marine Protected Area (MPA) fish monitoring field trip from 15-16 January 2019. Since April 2006 (with a break between 2016-2017), the ORI team have conducted extensive monitoring in the Pondoland MPA using multiple methods including research fishing, tag-recapture, underwater visual census, baited remote underwater video and monitoring of fish tagged with acoustic transmitters. On this trip, 125 fish were caught in the no-take area, which amounted to 9.8 fish caught per angler per hour. In the exploited area, 75 fish were caught amounting to 6.8 fish caught per angler per hour. Eleven fish species were recorded in the no-take area and 14 in the exploited area. Species composition was dominated by slinger (43), scotsman (42) and yellowbelly rockcod (12) in the no-take area, while catches in the exploited area were dominated by blue emperor (18), halfmoon rockcod (13) and small scotsman (12). The average size of fish caught was generally much larger in the no-take area. For example, the average size of scotsman in the no-take area was 479mm FL compared to only 379mm FL in the exploited area. Similarly, the average size of slinger in the no-take area was 298mm FL compared to only 246mm FL in the exploited area. A total of 119 fish were tagged overall with 76 tagged in the no-take area and 43 in the exploited area. Scotsman was the primary species tagged, accounting for 33% of all tags. Slinger was next on the list, accounting for 17% of all tags. Over the two days a remarkable 21 fish were recaptured with 19 coming from the no-take area and only two recaptures from the exploited area. The fish with the greatest distance moved was a scotsman that moved 953m in the Mtentu sampling area. All other recaptures moved a lot less with the average distance being a mere 245m from where they were originally tagged. The fish with the longest time at liberty was a Natal seacatfish that had been free for an unbelievable 3279 days (9 years)! During its time at liberty, this old fish has been recaptured no less than eight times, all within an area of a few hundred metres in the Mkambati sampling area! From this research, it is very clear that the Pondoland MPA no-take area is providing an important refuge for many overexploited fish species. Many popular linefish species such as scotsman, slinger, yellowbelly rockcod, black musselcracker, etc. are much more abundant and of a greater size in the no-take area than in the adjacent exploited area. Some species such as black musselcracker are known to spawn in this area and the increase in juvenile black musselcracker in the exploited area reported by local ski-boat anglers bears testimony to the potential of the no-take area to seed adjacent areas. Similarly, over time ORITag has seen a number of adult fish species such as scotsmen and slinger leaving the no-take area and moving northwards up the coast presumably to spawn in warmer waters. This provides further evidence of spillover from the MPA, which is helping to enhance fish populations in the exploited areas along our coast.